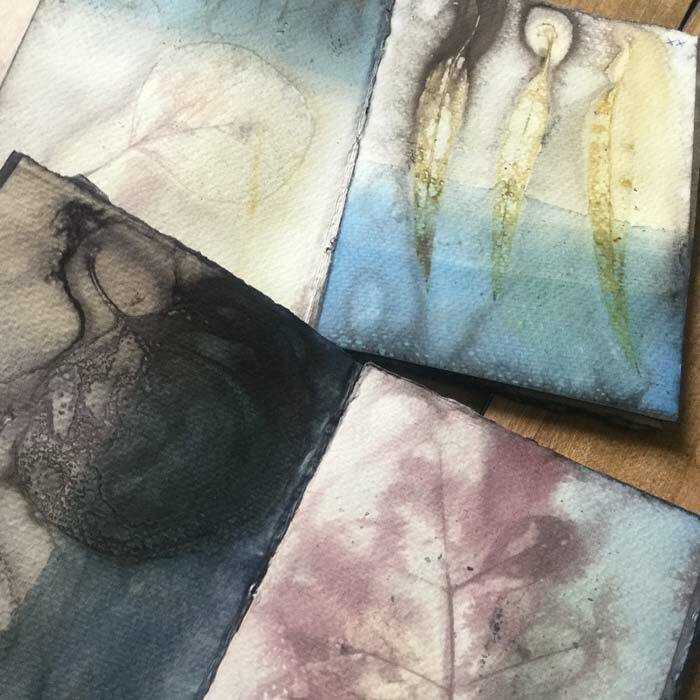 In late March I was in Prince Edward County for pleasure and took the opportunity to visit and interview three artists, including maker and marker Mags Kandis, whose makes and marks with Indigo+Rust, and is exploring botanicals. 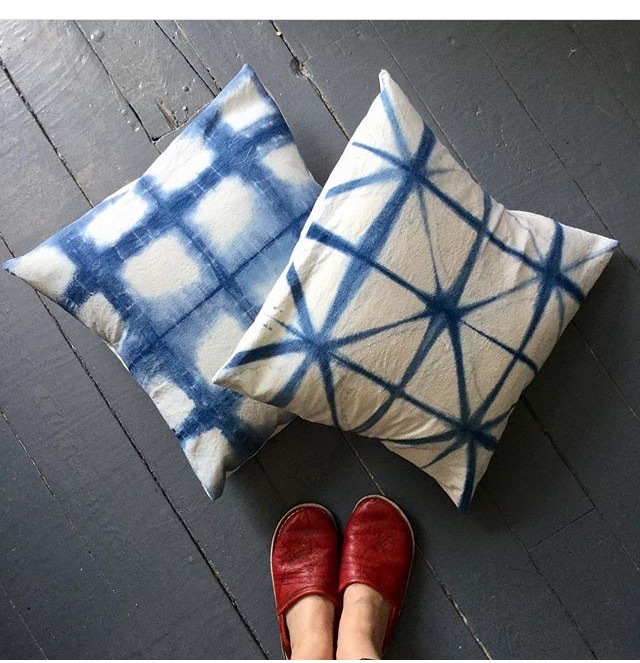 I look forward to seeing her new work this summer at the Wellington Market. 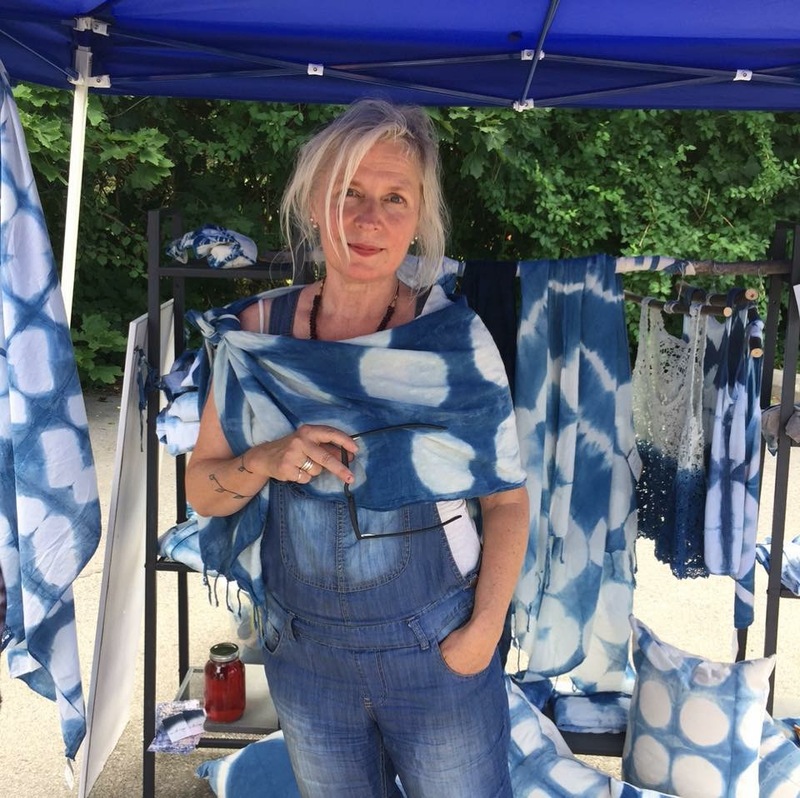 Listen on Amherst Island Radio on Wednesday at 6pm or Friday at 1pm for our chat about dyeing, marking, the Wellington Market, and more. You can find Mags Kandis in person at the Wellington Market (occasionally she is not there, so if you’re going specifically to see her work, contactMags first!) from May long weekend to the September (Saturdays 8am-1pm) or online on her website, Instagram @mags_kandis, and on facebook on indigonrust. 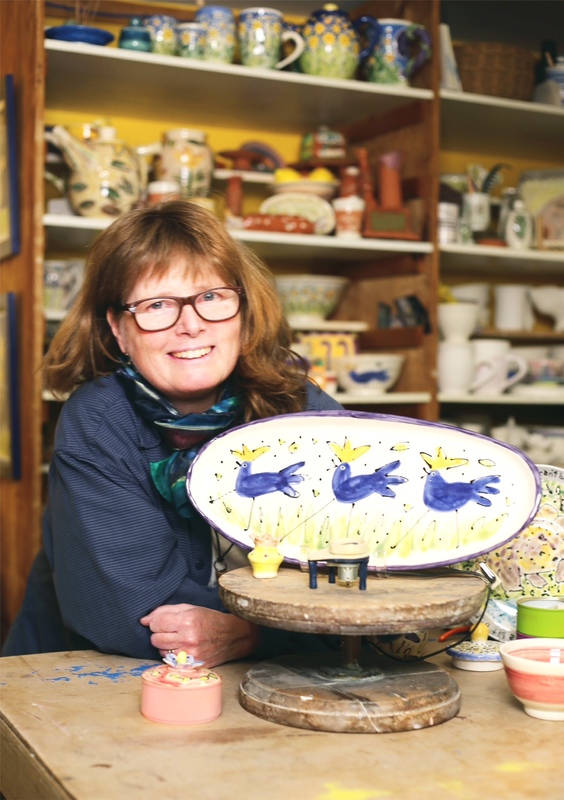 In February of 2019 I was giving a workshop at Karen Franzen’s Studio Under The Trees in Beach Hill neighbourhood of Toronto so we had a chat about Karen’s ceramic art and studio. Karen Franzen in her Studio Under the Trees in the Beach Hill neighbourhood of Toronto. 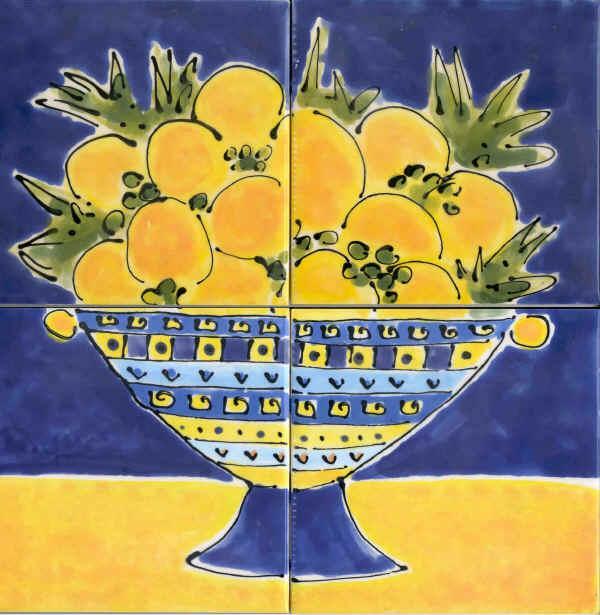 The bowl of lemons tile piece we discuss in the interview. Karen’s Studio Under the Trees is located at 3 Wembley Drive, Toronto. Please call for an appointment 416 465 7477. Check out Karen’s website, including her work, the workshop series, and her 506 Streetcar Project at karenfranzen.com . Find Karen and the 506 Project on facebook. Listen to the interview on Amherst Island radio on Friday, March 15, 2019 at 1pm or on the podcast (iTunes or GooglePlay) anytime. All images provided by Karen Franzen. Images used with permission. 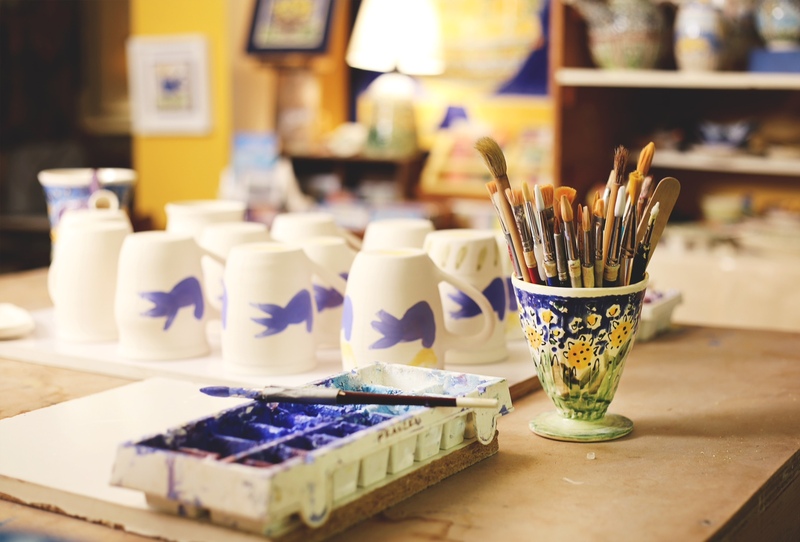 In January of 2019 I was visiting family in Guelph, so took the opportunity to interview potter Iris Dorton of Blue Iris Studios. Listen to the interview as we talk career changes, name homages, finding the right studio and more. Radio program will air Friday, February 15, 2019, and the podcast is up (links at the bottom of this post)! My new favourite of Blue Iris Studios pottery are the travel mugs! Blue Iris Studios is located at 179 Woolwich St in Guelph, Ontario. Find more at blueirisstudios.ca, on facebook at blueirisstudios, or on instagram at @blueirisguelph. Listen to the interview on Amherst Island radio on Friday, February 15 at 1pm (encore airing the following Wednesday at 6pm) or on the podcast (iTunes or GooglePlay) anytime. All images © 2019 Lynn Wyminga unless otherwise noted. Images used with permission. 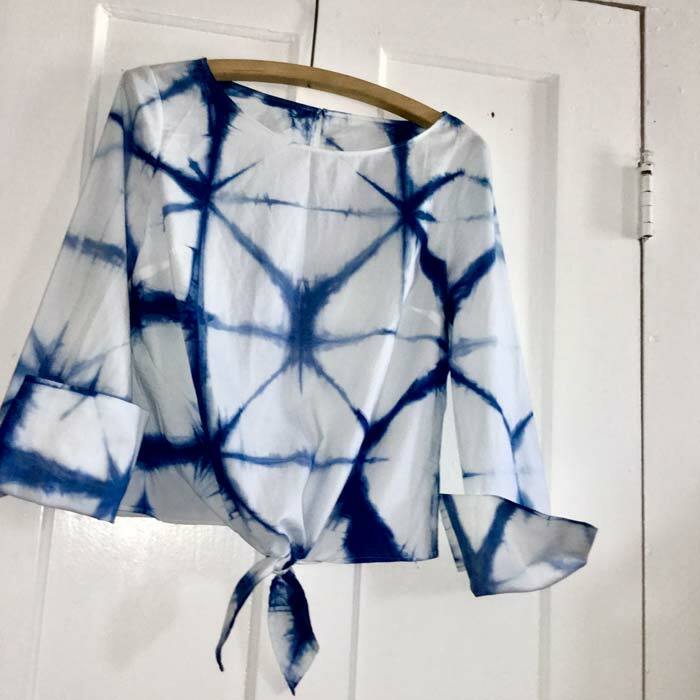 For episode 14, I spoke on the phone with recycled textile artist Joanne Jones of mined reCREATIONS in Cambridge, Ontario. I started following Joanne on Instagram a while back and met her in November 2017 at a Toronto show, where our fundraising plan was hatched. 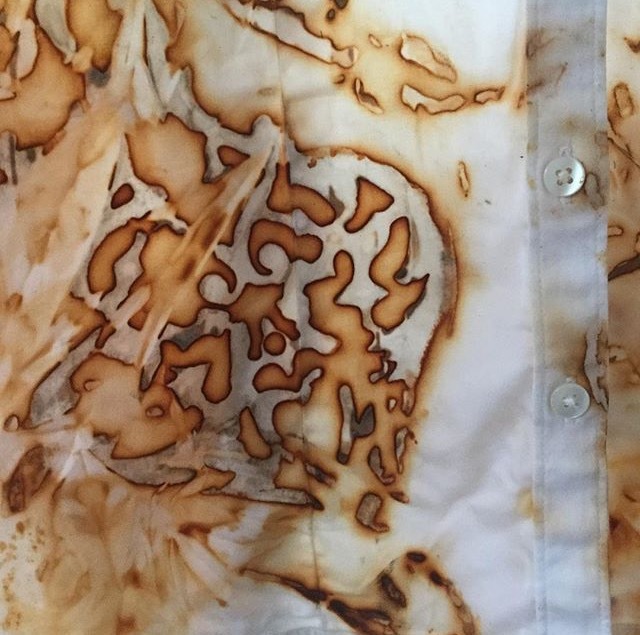 Hear about how Joanne got started in recycled textiles, her process, her amazing scholarship project, and a bit about our fundraising collaboration in the interview. See Joanne’s work in person at booth U54 at the upcoming 2018 One of a Kind Winter Show in Toronto, or visit her studio at 1916 Coronation Blvd. in Cambridge. Website minedrecreations.com, instagram @minedrecreations and facebook minedrecreations. As promised, here’s the rug made by her grandparents that sparked Joanne’s interest in recycling textiles into beautiful, durable creations. Joanne created an amazing weekend bag from my old university jacket, which I use all the time now. I was so excited that I posted a video of it on Instagram here. Listen to the interview on Amherst Island radio on Friday, Nov 9, 2018 at 1pm or on the podcast (iTunes or GooglePlay) anytime. All images © 2018 mined reCREATIONS used with permission. This summer I took a trip out to the Mountain View area of Prince Edward County to visit County Studio’s artists, and former islanders, Barb Högenauer and Terry Culbert. Their painting styles are very different (see below) but listen to this fun interview to hear how they work together as well! 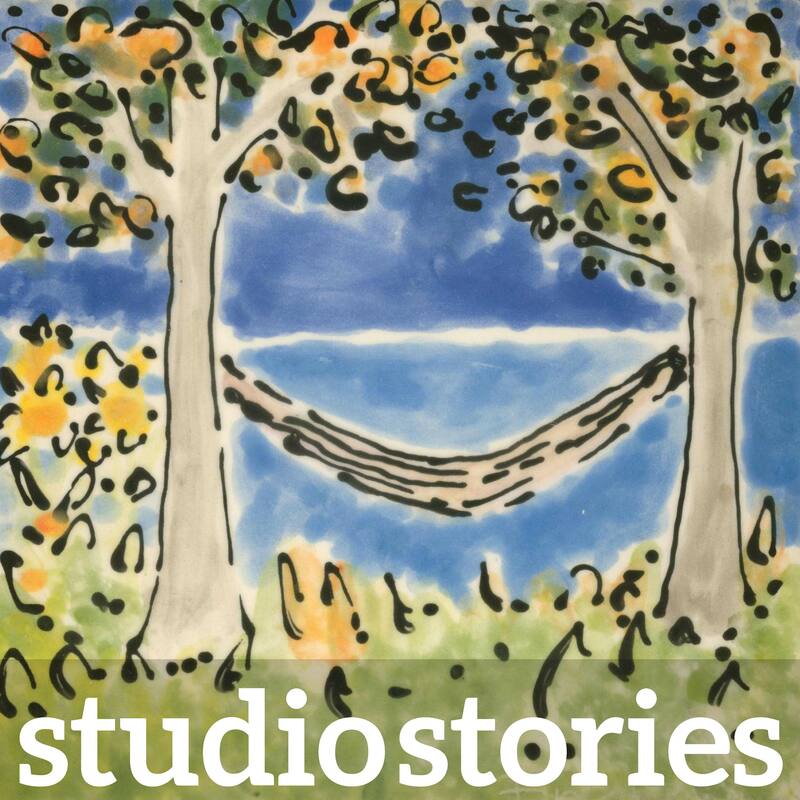 Terry and Barb’s County Studio is stop #3 on the upcoming Prince Edward County Studio Tour on September 21-23, 2018 (tour map). Find their work in person: by chance or appointment at their home studio, at Arts on Main Gallery in Picton, or SideStreet Gallery in Wellington. Find them online at countystudio.ca, on Facebook, or @barbarahogenauer and @terry.culbert on Instagram. Listen to the interview on Amherst Island radio on Friday, Sept 14, 2018 at 1pm or on the podcast (iTunes or GooglePlay) anytime. This August 17, 2018 episode (12) is the second of two short interviews I did at an art show north of Kingston at Lower Brewers Lock back in June of 2018. My booth neighbour at that show was Kingston-based Veronica Lloyd of Sable Dog Paddles, who paints gorgeous paddles, some new, some used, some custom, and *almost* all of them functional (occasionally some of the used ones are beyond repair). Sable dog paddles paints mostly artisan canoe paddles, but is happy to do oars (2 above on the right) when she can find them, too! Many are old, refurbished and refinished but some are new as well (sourced locally). Ronnie also had a couple of axes with gorgeous painted handles. Sable Dog Paddles gorgeous artisan canoe paddles. You can find Sable Dog Paddles on Instagram and Facebook. 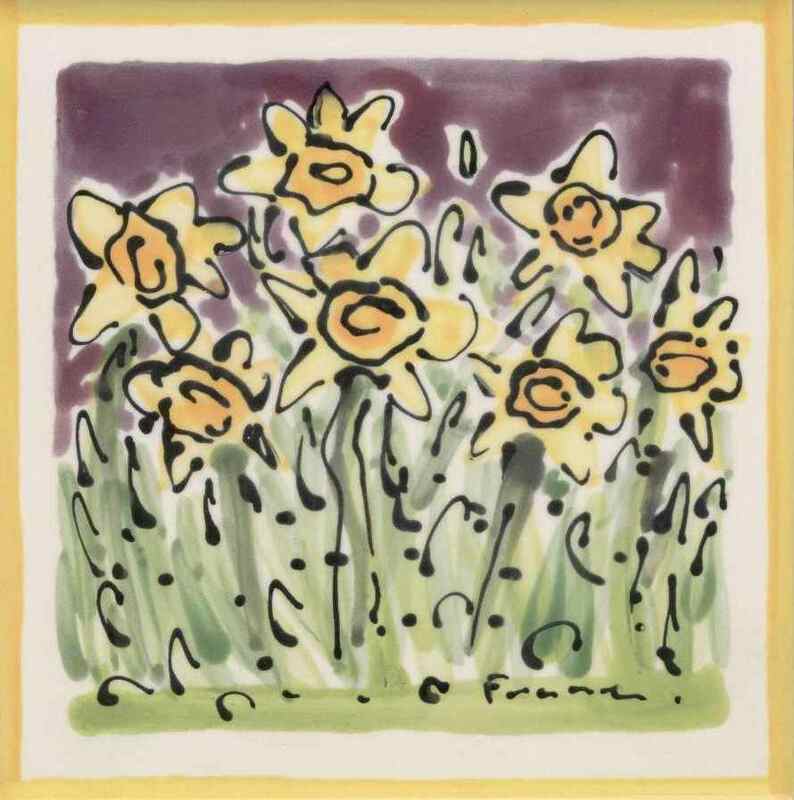 Ronnie’s next show is the Women’s Art Festival in City Park on August 19, 2018. (Below is from Ronnie’s instagram feed). 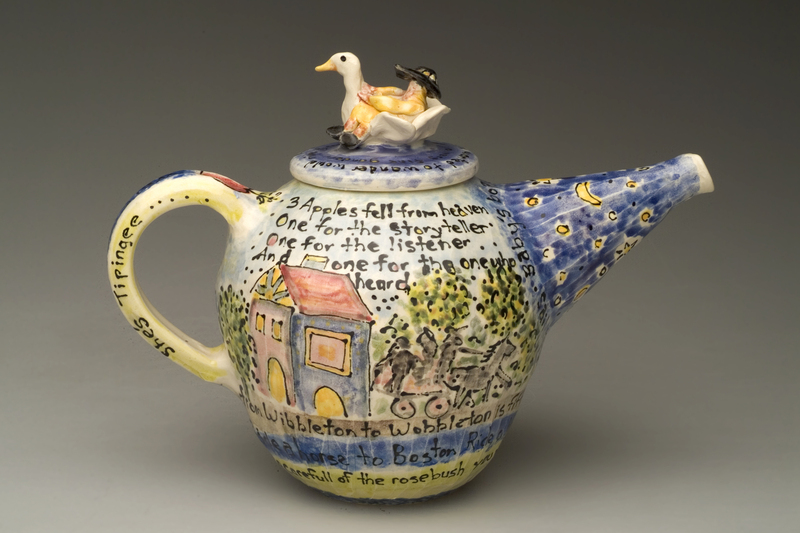 She also currently sells at the Cornerstone in downtown Kingston and the Skiff Café in the Ivy Lea Club. Photos copyright 2018 Lynn Wyminga. Studio Stories 11: Caboose Co.